Russian Radio Online is an internet radio for Windows Phone with Russian music and news. This radio app enables you to listen to music, news and talk shows from Russia. As an internet radio, Russian Radio Online makes listening to free music online much more pleasurable due to its good radio streaming qualities. When listening to live radio, the worst case scenario is that, as a result of poor sound qualities, your song sounds like a very bad recording. With this free radio online, those worries are out of question. The radio app itself is a collection of many popular Russian radio stations, which are designed to suit almost everyone’s music taste. Therefore, the stations vary in their purpose. For those who enjoy the diversity of beats and other elements of pop music, there are stations such as Говорит Москва to suit their needs. Apart from pop music, other music genres are available, such as blues, rock, jazz, country and many others, which can be found at stations like Moscow FM, Rock fm, and Radio Zenit. Some other stations include Voice of Russia, Echo of Moscow, and Business fm where you can listen to news from Russia as well as from other countries. 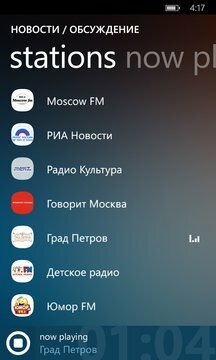 As you can see, the Russian radio app features many elements which contribute to pleasure people take when listening to music. If you like to listen to music and have a favorite fm radio station, there is an option to pin your favorite radio statio to the start screen. Should you enjoy relaxing to the sounds of classical music, you can set radio timer and play your favorite music at the exact time wanted. Other possibilities are: adding Russian radio to the list of your favorite radio stations, turning on the sleep mode, and sharing the stations with your friends. Russian Radio Online, a free radio application for mobile phones and tablets enables you not only to listen to your favorite beats, but also follow the happenings both in Russia and the rest of the world. This application for Windows Phone is available for free download, so do not postpone the pleasure of listening to free music and news from the largest country spread on two continents.